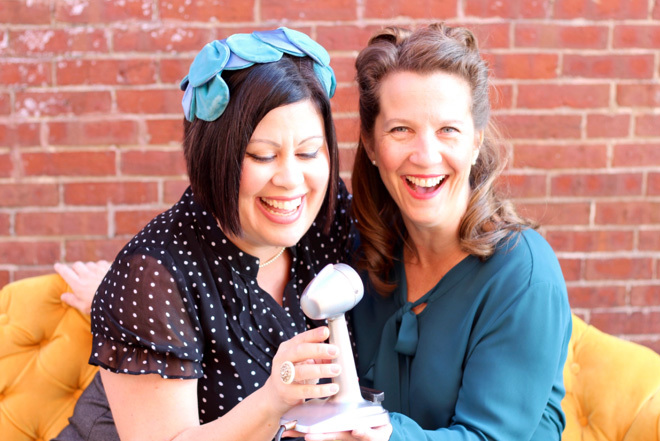 Hosting a weekly podcast since June 2015, this week on the blog, I'm talking to Karen and Zandra of the Little Yellow Couch, where concurrently you can also hear my podcast on their site here. You get a bumper blog post with the story behind the podcast plus a tour of each of Karen and Zandra's home. Itunes "new and noteworthy", these ladies get 13,000 downloads per month of their podcast which features "anyone who is anyone" in interiors from Maxwell Ryan of Apartment Therapy, Grace Bonney of Design Sponge to @fleamarketfab, @lizkamarul, @pinkhouseliving, @ericareitman the list goes on. 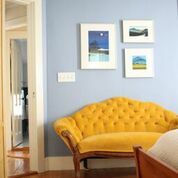 Little Yellow Couch tells the stories behind beautiful interiors to uncover the substantive reasons why style matters. In our weekly podcast, we interview top designers and stylists about how they view their homes in relation to their overall well being and happiness and talk about why cultivating a personal aesthetic is so rewarding. At its core, Little Yellow Couch has always been about connection, style and substance. In 2013, we started as a lifestyle and design blog. We shared our vision of living a life connected to he people and things we loved and getting rid of the things that bogged us down, emotionally, mentally, and in our physical spaces. 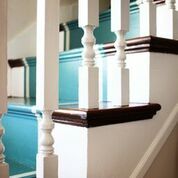 In 2015 we launched the Style Matters podcast as way of developing a community of like minded people who are passionate about their homes. As of Autumn 2017, we have produced over 85 episodes and are most excited by the relationships we're developing with our listeners and the guests we have on the show. I met Zandra the day I dropped off my then 3-year old son for his first day of Pre-school. I was still seeking out that balance between my artistic life and motherhood and was eager to find connections that spoke to both. Zandra walked up with her son in tow. She was confident and relaxed and COVERED in paint. My first thought was, “ I HAVE to know this girl!” I’d soon find out that she was a serial interior painter. I’ve lost track of the number of colors she has painted her house in the past 6 years ... but I’ve LOVED every hue. On our next encounter, Zandra approached me while I was carrying one of my bag designs from my fledgling business, Simply June. She wanted to know WHERE I got it. After telling her I made it, she immediately invited herself over to my house to see what else I was up to! That’s Zandra! She is connected, confident and inspired. She is drawn to design and lives it. From transforming her closet into an apartment as a child to her attention to detail in every corner of her home ... there is a story and sense of connection spoken. She and her husband Pete collect original artwork which inspires stories shared of not only the artists lives, but how each piece became a part of theirs. Her own designs share her sense of humor, imagination and curiosity in life. I highly recommend hanging out with someone whose collages depict pigs in teacups and sea captains riding giant fish! Zandra is also an intuitive friend. She knows when to cheer for you as well as when to come up along side you and support you. Her delight over the details in life lead to shared squeals of excitement (of which my son does a spot on impression). She is also an incredible writer - her transparency and excitement jump off the page. She lives her words and therefore transports you to where she is. She invites you to that place of creativity and thoughtfulness. I am going to be waiting in anticipation with all of you as to where she takes us next! This is my friend and business partner, Karen June Grant. Karen is one of those people who walks through a store and says, “Oh, don’t buy that! I can just make one for you!” She can whip up something using needle and thread, glue and paper, ribbon and beeswax… and to add insult to injury to the rest of us mere mortals, she is an ace graphic designer. Our beautiful website? Yep, that’s Karen. But the really cool thing is that when she makes something you are blown away by her craftsmanship and attention to detail. She’s that person in my life who, when she shows up with a surprise gift she’s made, I practically jump out of my skin in excitement. I just know it’s going to be THAT good. 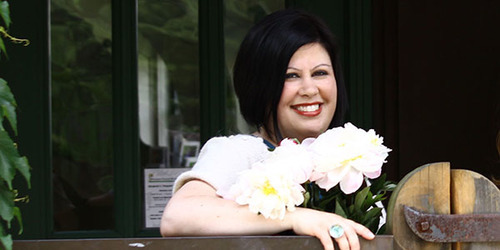 When we met in 2007, Karen had already started her business, Simply June. She sewed, crocheted, and embroidered gorgeous pieces of art, jewelry and household goods. She and her husband had also recently adopted their son from Russia. Having him has been an inspiration to her, both to be the best at whatever she does, as well as clarifying her values and priorities. One of those priorities is to be the primary steward of her family home Greece. It’s a little crazy trying to renovate and care-take from Boston, but the community of Arfara is deeply part of who she is and gives her work and life a particular perspective that I love. What else do I love about Karen? She’s effusive in her praise of anything that excites her so that being around her is like getting a free and legal shot of “happy” drugs. She’s incredibly generous with sharing her time, talent and energy. She’s one of the most articulate people I know, which is how you can tell she’s really smart. And her personal style is to die for. We started Little Yellow Couch as a means to convey our passion for a lifestyle that focused on quality over quantity, creativity and an appreciation for all things vintage. We weren't exactly sure how this was going to play out, or how we were going to monetize our efforts so we've done quite a bit of experimentation. 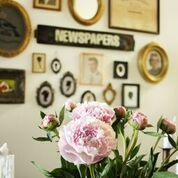 We curated a few collections of handmade goods, we did a lot of blogging, which made us very good at content creation, we taught creative workshops and we took on private interior design clients. So our schedules were packed but we were still struggling to find an audience that connected meaningfully with what we cared about. All of that changed once we started the Style Matters podcast. 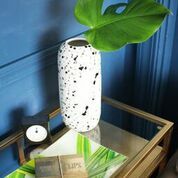 By interviewing top interior designers and bloggers and asking them why developing purposeful and meaningful style is so important, we've found our tribe of like-minded people who want to create a sense of well being, inspiration, warmth and passion in their own homes. The podcast is supported by sponsorships, which essentially means a 60 second pre-roll ad on the show where we endorse and recommend products and services by companies we believe in. Because these ads only cover a portion of our costs, we are currently working on an e-course about mindful design and hope to add other, high-value experiences to our listeners in the near future. There is a lot of business advice out there for creative entrepreneurs. We've taken advantage of many blogs, podcasts and other free resources. It's hard to know when to plunk down a lot of cash for a business course, so we recommend following a few people on social and accessing their free content for awhile to make sure you trust them and like their teaching style before committing to anything. But eventually, you're going to need some mentoring and objective criticism to move forward. Something that has been in our favor before paying for business coaching has been our long standing efforts at content creation. Since you need to have a well established voice, along with a professional-standard visual brand (both graphically and through photography) before you can really expect to monetize, it's been helpful to us that we already had that under our belts. Perhaps the most crucial element of our business is our partnership. Because growing a business from scratch is slow going with lots of ups and downs, you need to have some tenacity and willingness to see things through. We always say that if we didn't have each other, this business probably wouldn't have lasted more than a year. If you are going it solo, try to find someone else who is at a similar place in their own business to be your sounding board, your cheering squad and your tough-love coach. If you can do that for each other, you'll be much more likely to succeed! Another thing that keeps us going is to constantly keep our curiosity at the forefront of what we're doing. When we pursue a guest, a project, or a collaboration based on genuine curiosity, we feel energized. And that translates to our audience feeling connected to us and inspired to do something new and brave in their own homes. It's so easy to be distracted by some new idea on how to make money. Now, don't get us wrong, we love making money! But when a potential money-making project takes us away from our core activities, we've always regretted it. 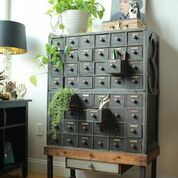 We have some similarities in our personal styles in that we both love layers, we embrace color and pattern, and we are devotees of vintage objects. If something has a backstory, we want to know what it is, and probably want to bring it into our homes. Our styles distinguish themselves from each other through our individual experiences. Karen is deeply tied to her family in Greece and incorporates things like olive wood and Greek religious icons into her decor. Zandra embraces her New England family history, both through her attachment to the ocean and her great-grandfather's biscuit business. Karen's home supports her desire for coziness and sanctuary, while Zandra's reflects her need to feel energized. Both of us love to change things up so we've each developed quite an eclectic style. Zandra's home is filled with art that she and her husband, Pete, have collected for over 20 years. Karen's home is decorated with many things she's made herself because creating by hand is a huge part of who she is. For both of us, some of our favorite materials to decorate with are brass, ironstone, marble, wood and woven textiles. We both love taxidermy, feathers, candles and lots of pillows. Karen collects silhouettes, bells and has several elephants. Zandra collects vintage tins, paint-by-numbers and owls. Nicola says "what an amazing journey the girls have been on to get where they are today. I love how strong their partnership is, how they've grown their business in different directions landing on their very popular podcast and that their drive and passion is evident in everything they do"
"and they have beautiful homes"